Our Brodiaea are grown outside here at Cornish Blooms. They flower in June and early July and are a pretty blue flower, rather like a small agapanthus. They look striking in the vase on their own or mixed with our Scented Pinks. Brodiaea grow from corms, which rapidly multiply. We lift the corms every few years to maintain high quality flowers. Brodiaea are available to send with our Flowers by Post service during June and early July each year. 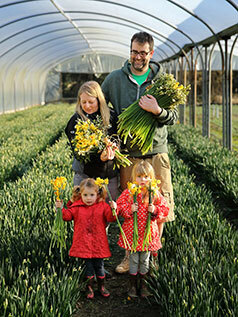 Cornish Blooms, a Cornish flower farm delivering flowers by post throughout the UK. With over 30 years of flower growing in the family, we know a thing or two about the growing and delivery of flowers and will always endeavour to send you the freshest and most cared for flowers by post for you to enjoy. Thank you for supporting our Cornish flower farm.